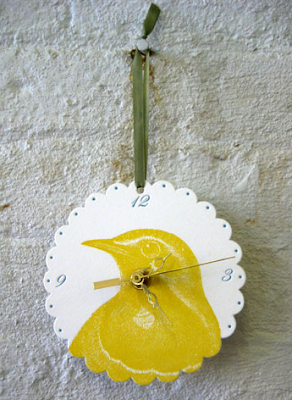 This adorable Letterpress Bird Clock inspired my "yellow" post today. Yellow isn't usually a color that pops in to my head when designing or thinking up new color schemes...I guess because it can be so bright and obnoxious if not used the right way. I've witnessed many clients attempt to find the perfect yellow paint color for their walls, only to end up with a bright, sunny, irritating mess of disappointment. Yellow can be tricky, that's for sure! I think the key thing to remember with yellow is to use it sparingly. Don't overdo it - a little goes a long way! 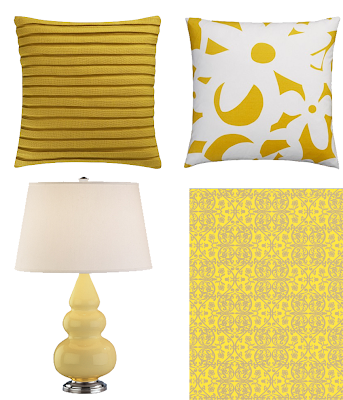 Clockwise from top left: Pleat Pillow; Daisy Pillow; Sassy Ceramic Table Lamp; Grace-Yellow Wallpaper. 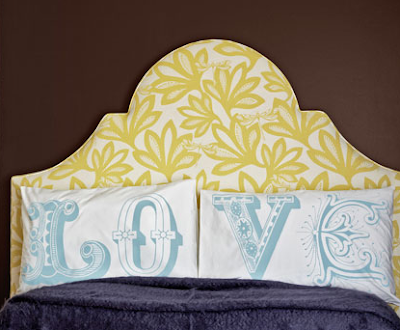 I love the way the designer mixed this yellow & white headboard with a chocolate brown wall and blue pillows. The deep brown keeps the yellow toned down and the overall look fresh and sophisticated. 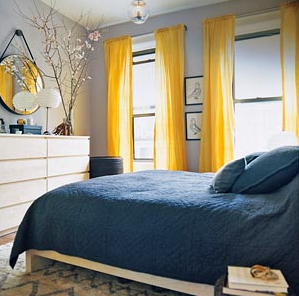 Taxi-cab yellow transitions nicely from this fantastic coat to this bedroom. Simple clean lines, crisp white and soft grey are a nice backdrop to the bold color. Clockwise, from top left: This chest looks fantastic painted with contrasting yellows and I especially like the touch of green accents set-up on top; a great little chair to make a big statement; Fabric Amy Butler Midwest Modern II Park Fountains Yellow ; Lulu Moon 4 Flowers Stretched Wall Art (this would look beautiful hung on a charcoal grey wall). Green apples are beautifully displayed the Lisbon Serving Bowl from Pottery Barn; Also from P.Barn, the Emery Wingback Chair in Yellow Squash Ikat fabric. Although the drapes are bold and bright, they create the perfect balance in this calm, serene bedroom. Nice post on yellow. A sometimes hard color to deal with, but yes, in small does it can be fabulous. oh the LOVE pillows are so adorable! Yellow can be used to excellent effect (Monet's dining room); I think the key is the shade and depth of the color. Cool, pale yellows are easier to manage, in my opinion, though I once did a dining room in maize with white trim and black and white artwork, to great effect. Great blog, btw. I really enjoy visiting! 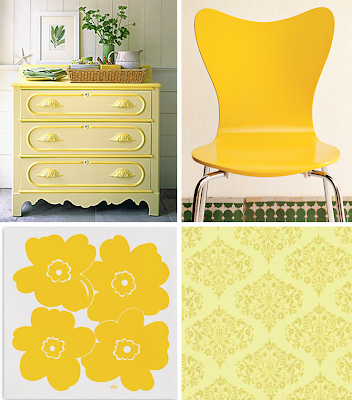 I love yellow too - such great examples! Great color! I love the table lamp. This post can't help but liven the spirits! Such beautiful images. I especially love the yellow trench coat up there! you are dead right about yellow. USE WITH CAUTION! i like it more and more the older i get. Georgia - me too, I like it more and more as time goes on! I just happened over here from http://bloggoggles.blogspot.com and I'm already in love with your blog and adding it to my blogroll. Just lovely! 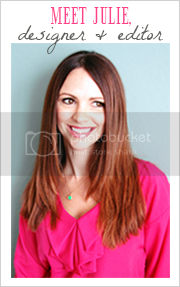 Stop by at http://thelishlist.blogspot.com anytime! What a lovely post!! I am definitely in a yellow mood right now, with the spring weather approaching..
love the headboard with the LOVE pillow shams. I love yellow, it's such an under used color!!! Beautiful pictures!! I have a yellow trench just like the one above!! Yellow is SOOOOO cheerful! ADORE that yelow trench coat! And of course your collection of decor is DIVINE! Yum yum! For starters, a clock that is letterpress AND a clock? that's like two of my favourite things rolled into one! and that domino outfit to room transformations is one of my all time faves. 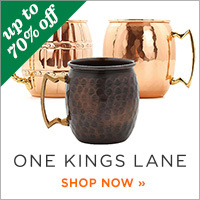 gorgeous round up! I love yellow and this is a beautiful use of it.